MP100 Dewind Instructions using spinner arm retarder units. 1. Place the spool on the centre of the stand. 2. Place the spinner arm retarder unit on the top of the reel. 3. Thread the lead end of wire through the flexible spring and into the stitching head.Keep the wire under tension whilst threading to prevent dropping laps of wire. 4. Adjust the tension of the spinner arm with the wing nut, clockwise to tighten and anti-clockwise to loosen. 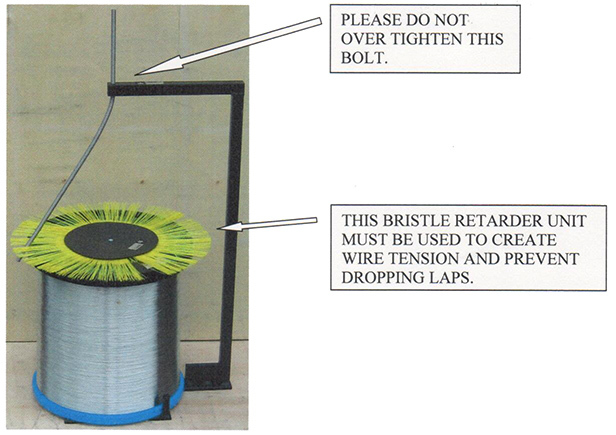 MP100 Dewind Instructions using whisker retarder unit. TO PREVENT DROPPING LAPS AND TANGLES THE BRISTLE RETARDER UNITS MUST BE USED TO CREATE WIRE TENSION. 1. Place the reel on the stand. 2. Place the metal ring with bristles, on the top of the reel. 3. Remove the starting end and thread through the flexible spring and into the stitching head. 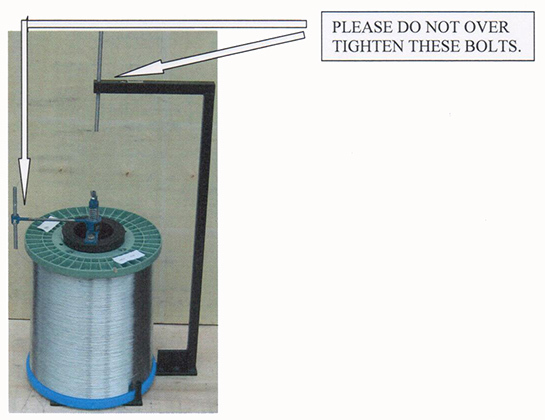 PLEASE KEEP THE WIRE UNDER TENSION WHILST THREADING.